Understanding the risks and rewards of condo and homeowner association ownership. If you’re thinking about buying in a condominium or homeowner association, or if you’re already an owner in one, you’re not alone. Today, 4 out of 5 real estate sales are in association communities. There are lots of great association properties out there, but you need to know that there are some very real horror stories, too. 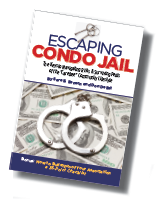 You can read about some of the classics in Escaping Condo Jail. We, Sara and Don the authors, want you to buy our book, of course. But more importantly, as condo owners ourselves, we want to see change. You’ll see on this web site that we are making key sections of our book available in hopes of a better managed and more transparent future for so many of us who now live this way. When you buy, or own, in an association, you are buying into a mini-governmental entity. It may be as well run as Switzerland or reminiscent of the worst of Third World countries. And the fact is, due to lack of regulation, condos are the riskiest form of real estate ownership, second only to “time shares” that are not designed as primary residences. How to minimize the risk when buying a condo or association property. While it is now common practice for purchasers to hire a home inspection firm to examine mechanical and structural problems in a specific unit, this typically does not include inspection of the common elements, and more importantly, the association itself. Disclosure of the association’s documents and finances is the key. You’ll see an overview of our recommendations for buyers in the Essential 10-point buyer checklist below. The full checklist with disclosures is available if you click on our Resources section. Your first point of focus needs to be on the fiscal and physical health of the actual condo or homeowner association. This is absolutely critical in making a profitable investment decision. That’s why you must not agree to any contract of sale without disclosure. Further we recommend that any purchase contract state it is subject to your attorney’s review. How to maximize the rewards of owning a condo or association property. This is arguably the most important priority of all. Chances are the common elements compose a substantially larger mass area than the individual unit. That means the financial impact of all kinds of maintenance and improvements can be a major burden unless there are suitable reserves and effective budgeting. Our other advice to association property owners is to be actively involved in the governing of your association. This is your assurance that you have knowledgeable directors and officers and that they are representing and protecting the best interests of all the owners. Take a look at the 10 Hallmarks of a Healthy Association below. Pay special attention to #9. Do everything possible to prevent lawsuits. Lawsuits can truly devastate and paralyze a community as well as having a chilling effect on resale. Quality of life…Spend time at the property, such as on a Saturday. Attorney review…Be sure your contract provides for it. Assessments and Special Assessments…review what’s included and history of special assessments. Financial stability… Does the budget conform to Generally Accepted Accounting Principles? How much of the gross annual assessment is set for reserves. 10% is typical. Delinquencies…Find out the percentage and compare it to guidelines. Owner Occupancy Rate…The best associations are 80 per cent and above. 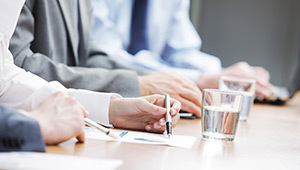 Corporate Governance…Ask if there are code of ethics and conflict of interest policies signed by the directors. Lawsuits…Proceed carefully if lawsuits are brewing. Take a good look at the common areas for signs of neglect. 2. 100 percent transparent communication.